Finally, here’s a book that offers creative alternatives for middle school teachers who spend their summer sifting through piles of scripts in the quest for the perfect play. The ”drama-healthy” projects presented here will allow every one of your students to have a chance to get involved. A drama class whose curriculum is limited to play performances can actually turn kids off to drama because of that constant question, ”Who has the lead?” Middle Mania, using a compilation of interactive, collaborative projects, guarantees you will never be asked this question. With the projects provided, you’ll be able to challenge students to stretch their imagination and develop self-confidence. Read more...Here is your opportunity to introduce the exciting possibilities drama can provide while building a friendly, community atmosphere. 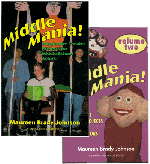 Continue the journey with more imaginative theater projects for young performers in Middle Mania Two! This book will help you use drama to bring youngsters together in creative, collaborative ways, plus it is a great tool for fostering a drama-healthy curriculum that can create a safe space in which students learn to trust and risk. SPECIAL OFFER! Buy both books for $31.00!Package pricing will not be reflected in your shopping cart, but we will manually adjust your invoice when we process your order.